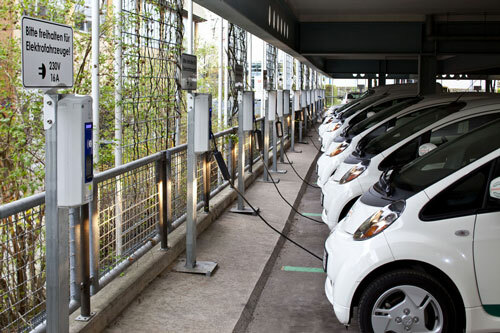 (Nanowerk News) Being able to charge up to 30 electric cars at once requires some ingenious energy management. Researchers are incorporating a mix of renewables into the design of a smart grid for Germany’s largest charging station. The network of charging stations for electric vehicles is becoming more tightly meshed. In Germany, the ratio of electric cars to charging stations is currently two to one and utility companies are pushing forward expansion of charging opportunities, especially in cities and metropolitan areas. Over 2000 charging spots have already been installed nationwide and the country’s largest charging infrastructure is at the Fraunhofer Institute Center Stuttgart IZS – where up to 30 electric vehicles (EVs) at a time can recharge at AC charge spots in the Fraunhofer Campus parking garage. There is also one DC fast charging spot that has a charging capacity of up to 50 kilowatts and can fully charge a car’s battery in just 20 minutes. Up to 340 kilowatts of electricity are consumed when all charging spots are occupied – equivalent to around 20 percent of the load of the entire Institute Center, which has a staff of 1500. “Charging an electric vehicle fleet poses high requirements on the energy system. Setting up an EV charging infrastructure of this kind is impossible without smart charging and load management,” says Dipl.-Ing Hannes Rose, head of the Mobility Innovation Lab at the Fraunhofer Institute for Industrial Engineering IAO. The aim of [email protected] is to design a micro smart grid (MSG) capable of supplying the EV fleet with electricity produced exclusively from renewable sources. This year will see the installation of a photovoltaic unit and a small wind power system at the IZS to provide power to the fleet. In addition, a lithium-ion battery storage unit will be added to the basement and a redox flow battery to the roof as temporary storage of energy. The 30-meter-tall wind turbine is delivering 10 kilowatts. Since it operates on a vertical rather than a horizontal axis, it does not have to be oriented to wind direction. Its investment costs are low. The MSG can be run in island mode in parallel to the grid operated by the local energy provider. “If our batteries are emtpy, we can connect the MSG to the local grid,” says Rose. What is special about this MSG is that it is designed as a direct current (DC) grid. “Photovoltaic facilities and battery storage devices both use direct current. We settled on a DC design for our micro smart grid to avoid the losses that occur when transforming alternating current (AC) into DC,” explains Rose. In addition to the energy management software, the IAO scientists are also setting up a simulation environment in which to lay out their MSG and play out various scenarios, such as different weather conditions. In their living lab, the IAO scientists now plan to create a testing environment that will allow industrial companies, systems providers, public utility companies, communities and distributers to explore the potential of micro grids. Over the next two years, the Micro Smart Grid innovation network is to provide interested parties with an opportunity to work up new kinds of smart grid configurations and operating strategies. Using the Fraunhofer micro smart grid demonstrator, the project partners can test their hardware and software components. They can also investigate options for allowing other consumers to connect to the MSG – whether, for example, to run a building’s air conditioning system or to integrate other production facilities. “Our long-term goal is to bring individual local grids together to form a large smart grid,” says Rose. Researchers will be presenting a virtual model of their smart grid at the Hannover Messe from April 7-11 at the joint Fraunhofer booth in Hall 2, Booth D18.